Here’s a question. Define the term ‘family car’. What exactly is a ‘family car’? There are so many categories these days that some vehicles fall into not just one or two categories, but three or four, and the poor great British public has to try and work out what exactly they want. I mean, what’s the difference between city cars and compact cars, or even sub-compact cars for that matter? There are saloons and executive saloons, not to mention sporting and luxury saloons. There are Hot Hatches and Sports Hatches, GTs and RSs, MPVs, SUVs and 4x4s and then A, B, C and D segment cars and who knows, we might get up to Z segment pretty soon? 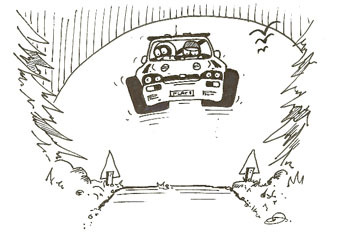 If we find it hard enough deciding what we want, pity the poor showroom salesman trying to find something to suit. It used to be that the term ‘family car’ defined an Estate Car but such is life these days, that simple description no longer does the job. The manufacturers claim that everything they sell is a family car, albeit a two seater convertible sports car could only be for a one parent family with one child! But where would the pram go? Some of them have a boot no bigger than a toilet bag. And then of course, there are ‘Lifestyle Vehicles’ whatever those are. 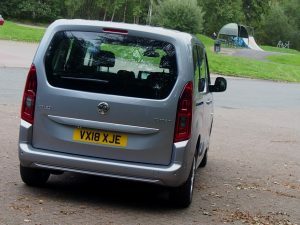 For what it’s worth, my definition of a family car is the Vauxhall Combo Life. For the average two plus two family it is hard to beat. There is actually room in the back row of seats to fit three kiddie seats just in case the parents stop taking precautions after the first two! 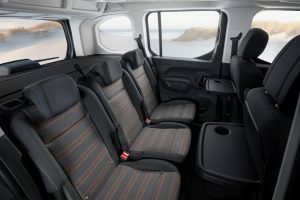 There are two individual and comfortable seats up front, plenty of headroom and leg room front and rear and the boot is huge. It also has a top hinged tailgate so you keep dry when unfolding the pushchairs. Two sliding side doors are a real boon for rear seat access even when struggling in the ever smaller, minimalist white-lined car park spaces at shopping centres. It is light and airy and the occupants sit slightly higher than the average saloon car so the kids can see better when playing I-Spy. There are also two drop down tables on the back of the front seats which will help to stop drinks and sandwiches ending up on the floor. The rear parcel shelf is also a rigid affair so it can actually support stuff and it can be set at two separate height levels depending on what’s being carried in the boot. OK, so it’s based on the Combo van, but that’s a good thing. You don’t want to drive this thing like a sports car if you have two or three weans in the back, otherwise you’ll end up with a multi-coloured, pebble dashed interior, some of which might end up running down your neck! Nope, this is for sedate drivers who want to ferry the youngsters and all their clobber around in perfect safety and practicality. 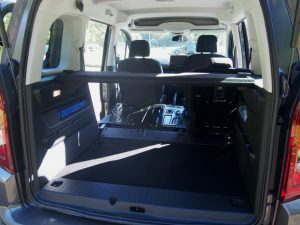 And if you do need a van to take stuff to the cowp or carry the lawnmower and gardening materials to the in-laws, just fold the rear seats flat and you’ve got a van. It may not have the flat-floor finish of the previous model, but it still makes a big square empty space for commercial needs. Ideal for the self employed weekday tradesman and weekend family man in fact. And if you still need more space, there is a 7 seater option and a long wheel base version of the vehicle. There are two trim levels, Design and Energy, with Energy models available as either a five- or seven-seater. 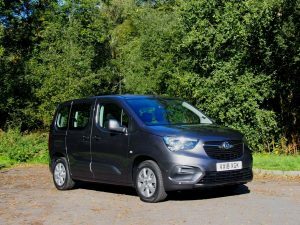 Priced at £20,530 on-the-road, the entry-level Design 1.2-litre (110PS) Turbo Start/Stop 6-manual model features standard specification including air conditioning, DAB Radio with USB and Bluetooth audio streaming. 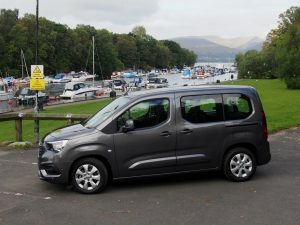 The Energy trim starts from £21,970 on-the-road for the five-seater 1.2-litre (110PS) Turbo Start/Stop 6-manual model and includes eight-inch colour touchscreen infotainment system, 16-inch alloy wheels and front and rear parking sensors. There are basically two engine options, a 3 cylinder 1.2 turbo petrol and a 4 cylinder 1.5 turbo diesel and they both come in a variety of power options, from 98bhp (100PS) to 128bhp (130PS) while the top of the range 1.5 litre diesel can be specified with an eight-speed automatic ‘Quickshift’ gearbox. Prices start from £21,100 and go up to £25,020, that’s not at all bad for what you are getting. The Combo Life has a lot going for it. Comfortable, spacious, practical and quite frugal. I like it.